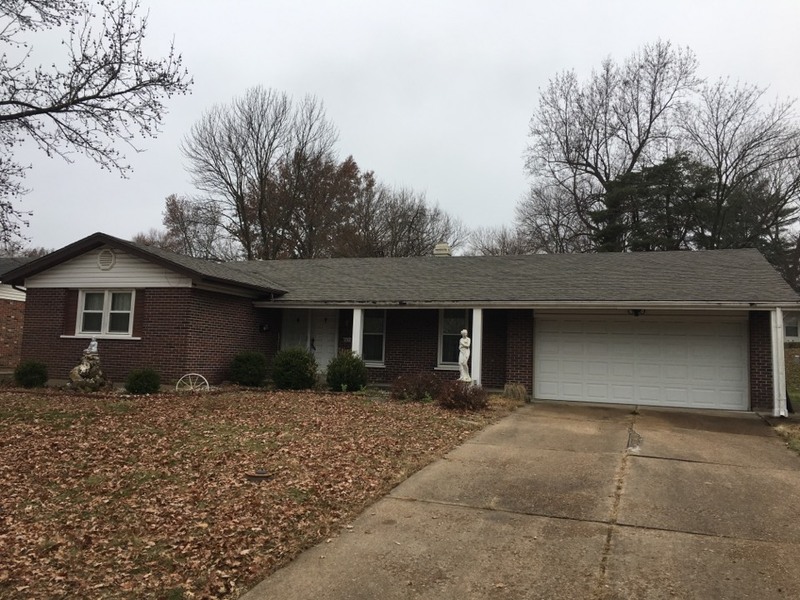 We installed a new roof today for this homeowner. She chose Owens Corning.duration architectural shingles, color = pacific wave. She also added Owens Corning vent sure ridge vent to provide energy savings & prolong the life of he shingles. She called with wind damage. We were able to call in an insurance claim & get insurance coverage to replace the whole roof. 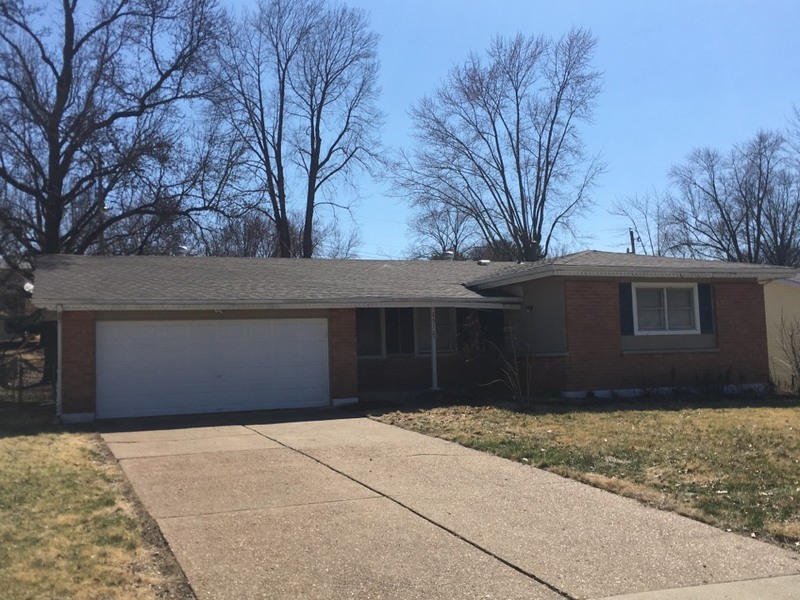 The client is very happy with the process with Renovation Team and with her new roof color! We replaced this roof today for a real estate investor client. They chose IKO Cambridge architectural shingles, color = weatherwood. They also added an Owens Corning VentSure continuous ridge vent to prolong the life of the shingles & provide energy savongs. This is best practice roof ventilation. Enjoy this view from the roof. We installed this new roof today for a real estate client. It was the second job completed today by the same productive roof crew. The client chose IKO Cambridge architectural shingles, color = weatherwood. We installed a new roof for this client today. She chose Renovation Team because she had an outstanding customer experience with us when we installed new siding in 2018. 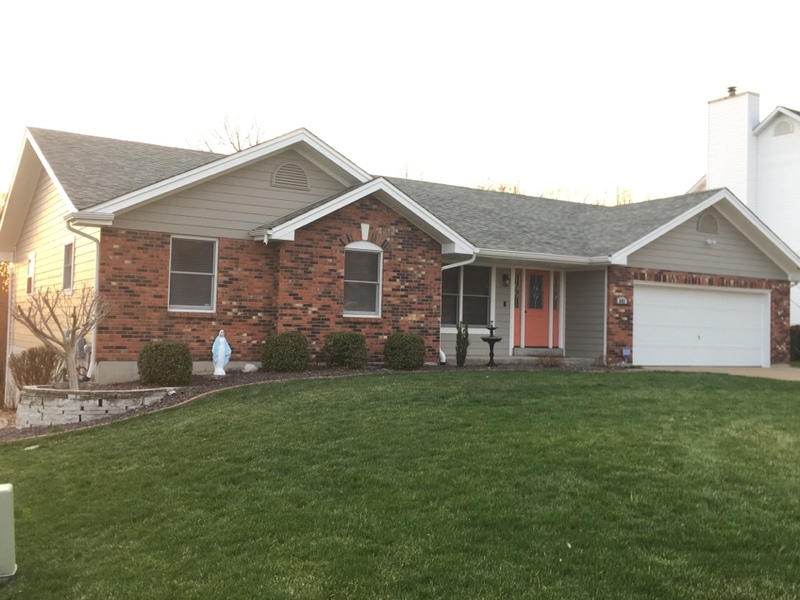 For her new roof the client chose Owens Corning Duration architectural shingles, color = storm cloud plus a continuous ridge vent to capture energy savings & prolong the life of the shingles. The client was very happy with how quick & efficient our roofing crew works. Here is another roof install we just completed today. This real estate client chose IKO Cambridge architectural shingles, color = weatherwood. We finished this LP siding project today. The client wanted to upgrade their old vinyl siding and chose LP SmartSide engineered hardboard siding, color = clay with white LP trim. The client also choose Mastic Ventura hidden vent soffit & white aluminum fascia wrap. 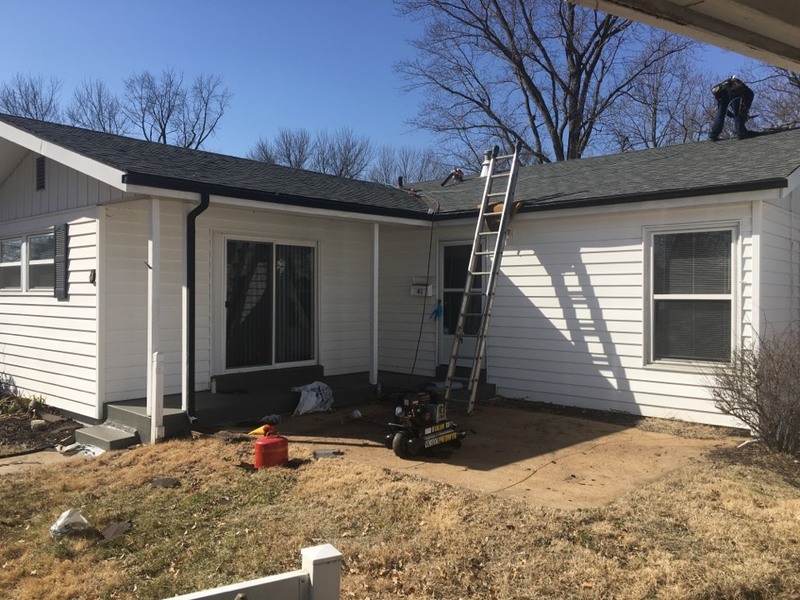 The client is very happy with the project and the siding crew. 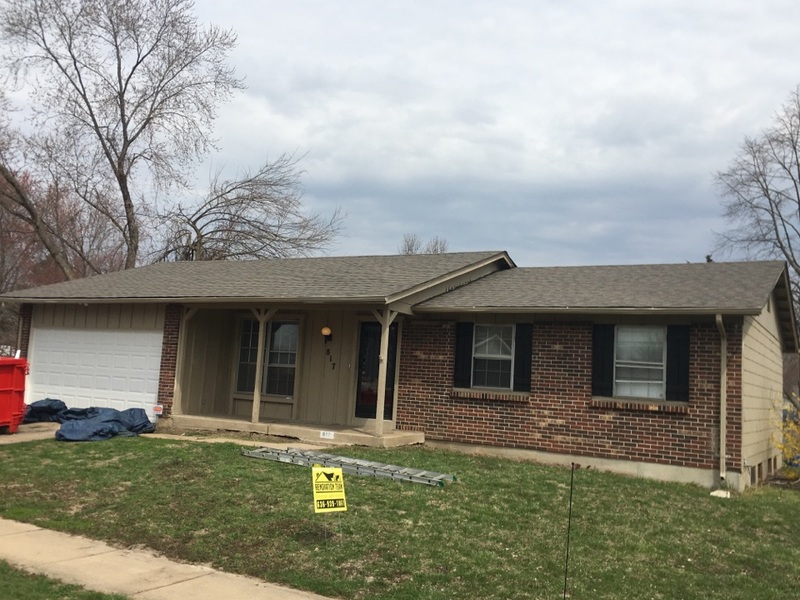 This new roof install was also completed today for our real estate client. They are extremely happy with our work on their various properties. The client chose IKO Cambridge architectural shingles, color = weatherwood. 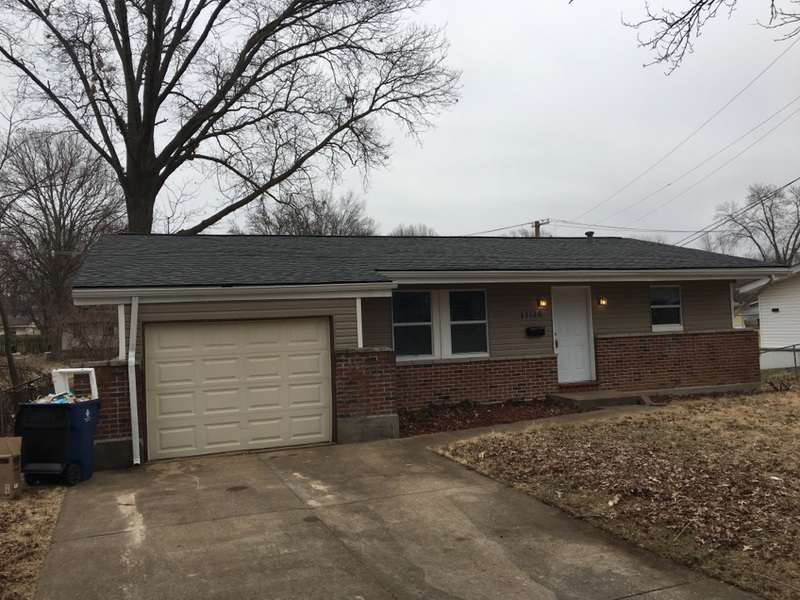 We installed this new roof this morning for a real estate investor client. They chose IKO Cambridge architectural shingles, color = weatherwood. 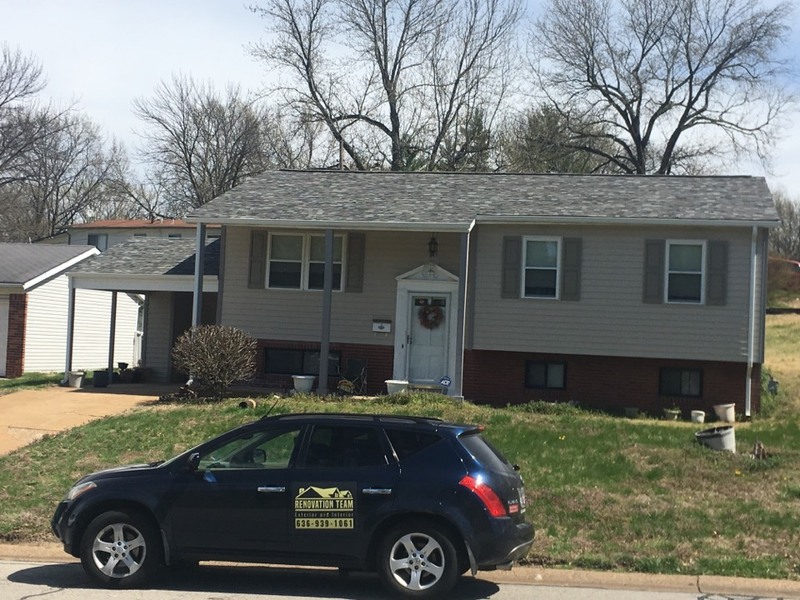 We installed a new roof today for this real estate investor client. 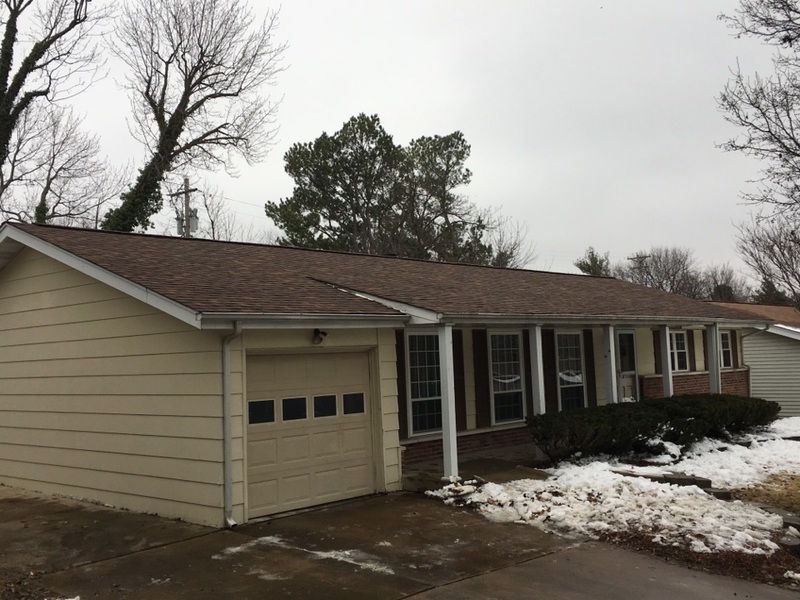 They chose IKO Cambridge shingles, color = weatherwood. Job completed in 1 day. We continue to make progress this week on this LP siding project. We removed vinyl siding and have installed LP engineered wood siding & trim. We are also installing vinyl soffit & aluminum wrap on fascia. 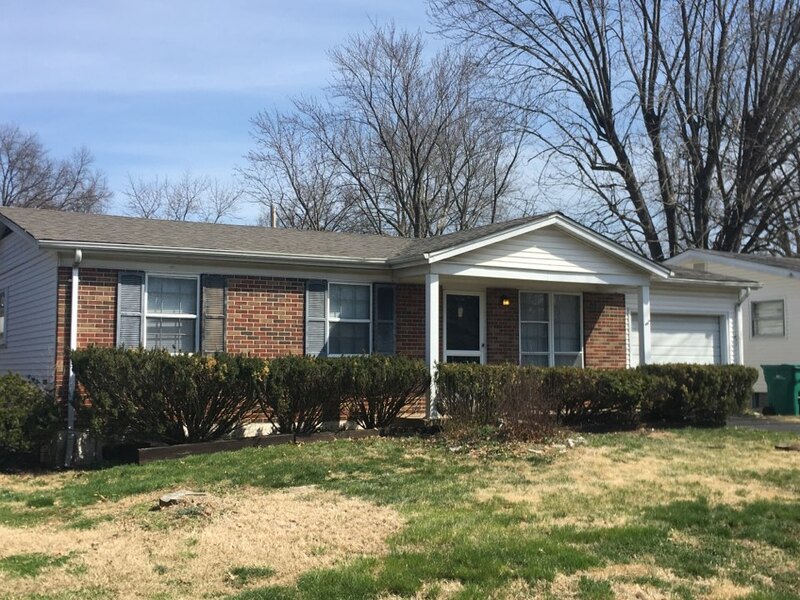 The client’s goal is to upgrade the exterior compare to vinyl siding and get to a maintenance free exterior. Progress from day 1 of our LP siding project. 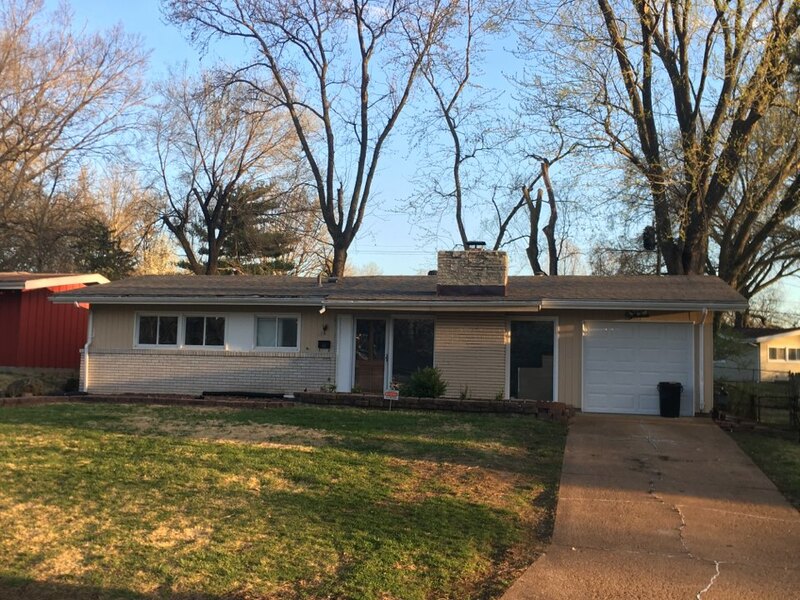 Client had us remove white vinyl siding and install LP SmartSide engineered wood hardboard siding, color = clay, with LP trim, color = white. We are also installing new white vinyl soffit and white aluminum wrap on the fascia. The client is thrilled with the new look! Just finishing another roof install today. This real estate investor client chose IKO Cambridge architectural shingles, color = charcoal grey. Our crew will complete tear off of 2 layers and complete install plus clean up by noon. 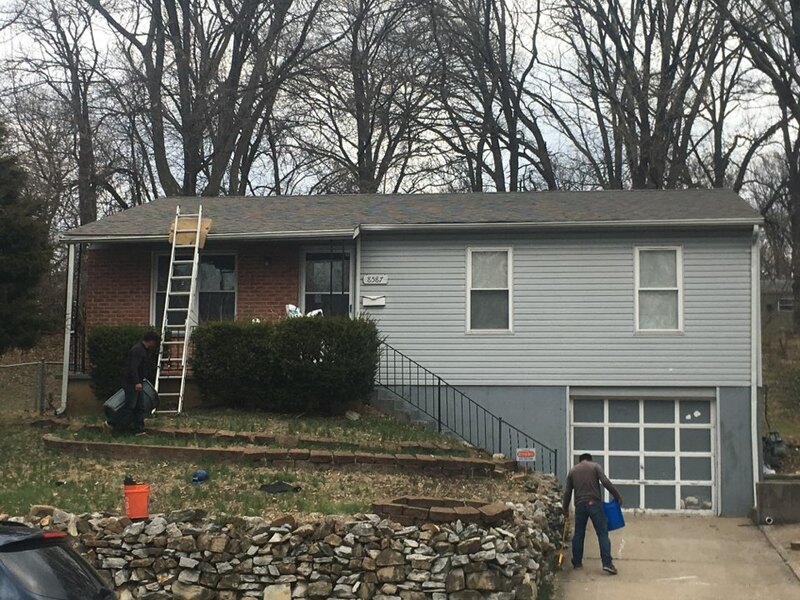 We started & finished installing a new roof today for this real estate investor client. 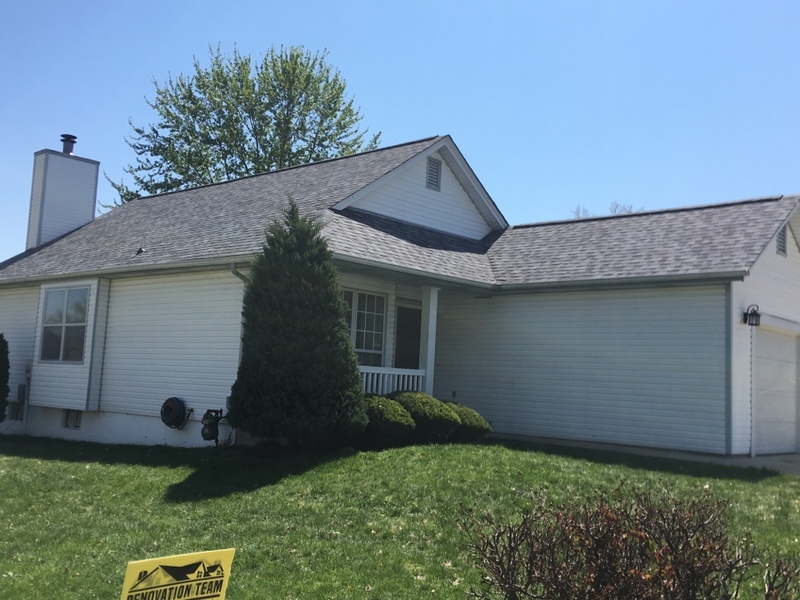 They chose IKO Cambridge architectural shingles, color = weatherwood. 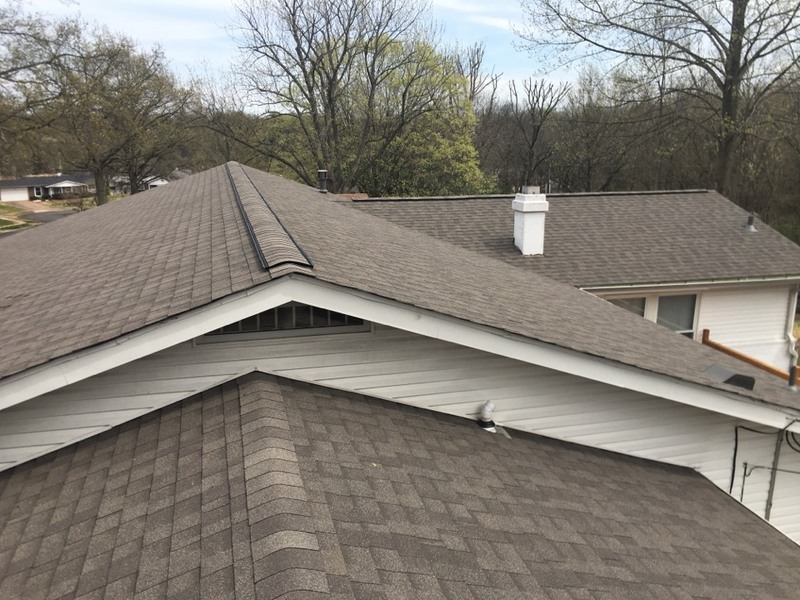 They also installed a continuous ridge vent for optimum roof ventilation to prolong the life of the shingles & provide energy savings. We installed a new roof today for a real estate investor client. The client chose IKO Cambridge architectural shingles, color = charcoal grey, with a continuous ridge vent. We finished the install in 1 day. We completed this roof install today. The client chose Owens Corning Duration architectural shingles, color = Sedona canyon with Owens Corning SureVent ridge vent to optimize roof ventilation. The client was very happy we could get this done before the closing date for the sale of this house later in January and was impressed with the speed and efficiency of our roofing crew. They also loved the color! We just finished this bathroom remodel in Creve Coeur. The client wanted a more open, updated, clean look. We demolished the soffit above the shower. 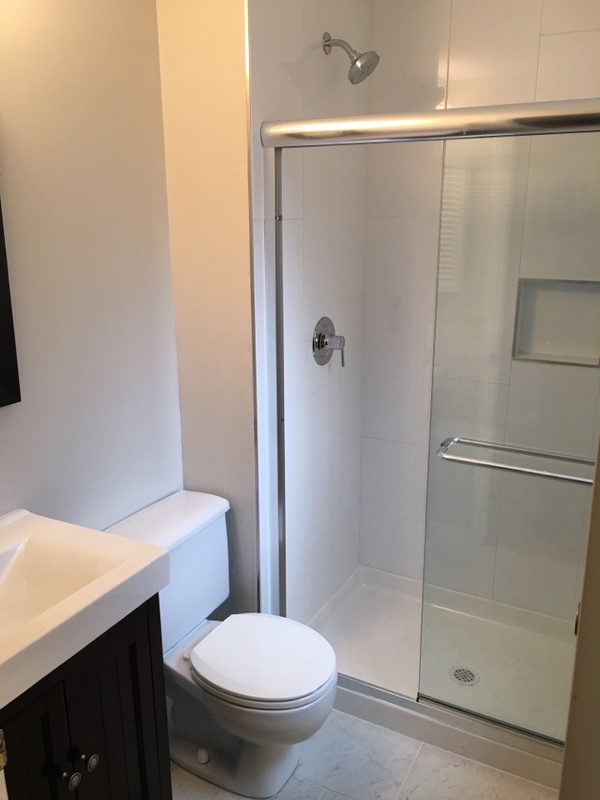 We installed 12” x 24” floor tile, 12” x 36” vertical wall tile with a cut out shelf, new shower fixture & paint on walls & ceiling. The client loves the new look! We completed this LP siding project. 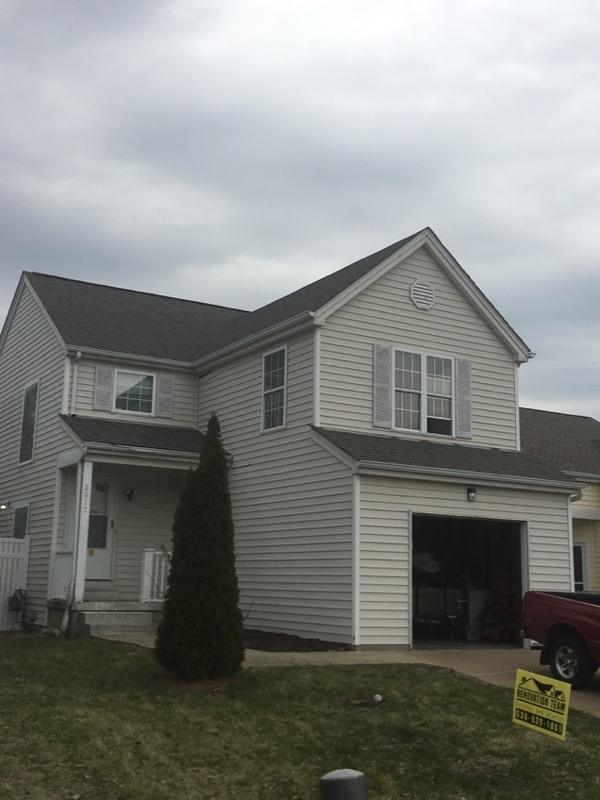 The client wanted an exterior makeover to replace vinyl with higher quality siding and to enhance the exterior look. They chose LP SmartSide engineered wood lap siding, color = olive with white LP trim. 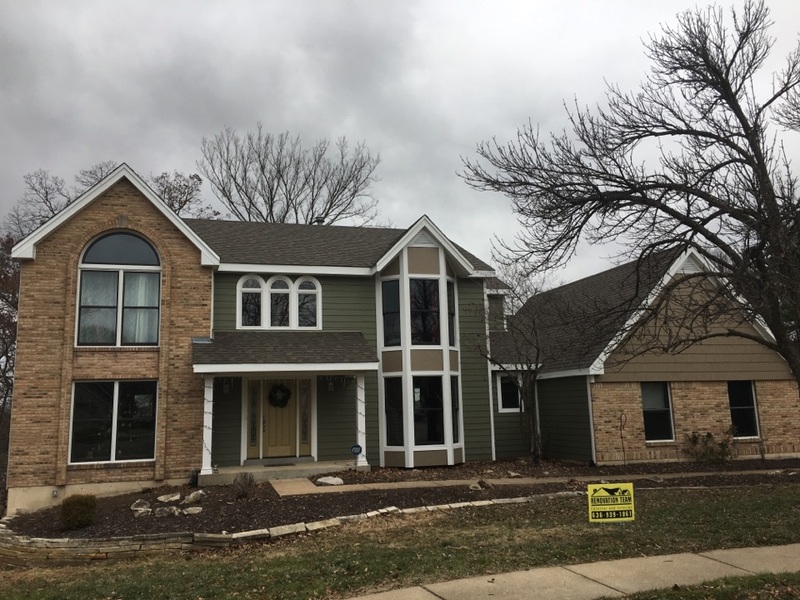 For accent in front they chose LP shake siding, color= French gray in the right gable and Hardie stucco panels in the bay window. They selected white Mastic Ventura vinyl hidden vent soffit with white aluminum fascia wrap. They are thrilled with results! 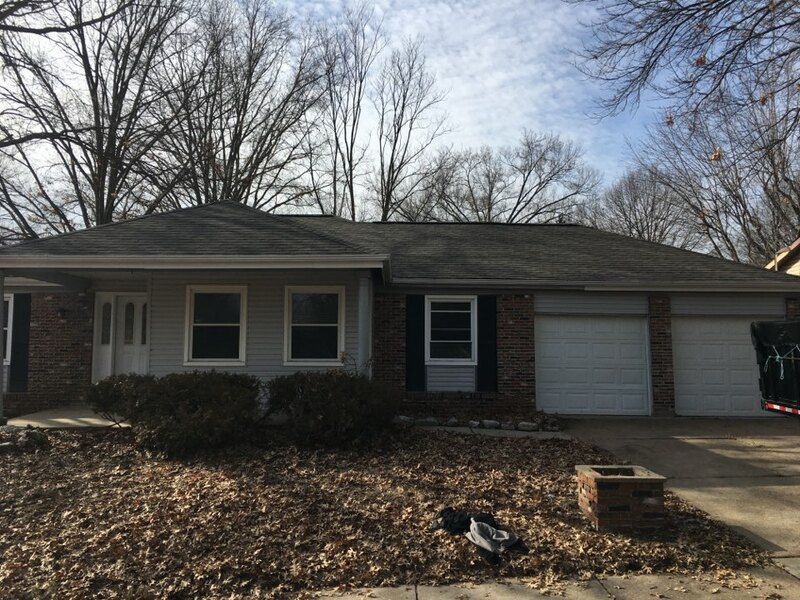 We installed a new roof today for this real estate investor client. We replaced the existing roof due to aging & leaks. The client choose IKO Cambridge shingles, color = driftwood. We completed the roof install in 1 day. This siding project is nearing completion. We still have new columns to install in front. 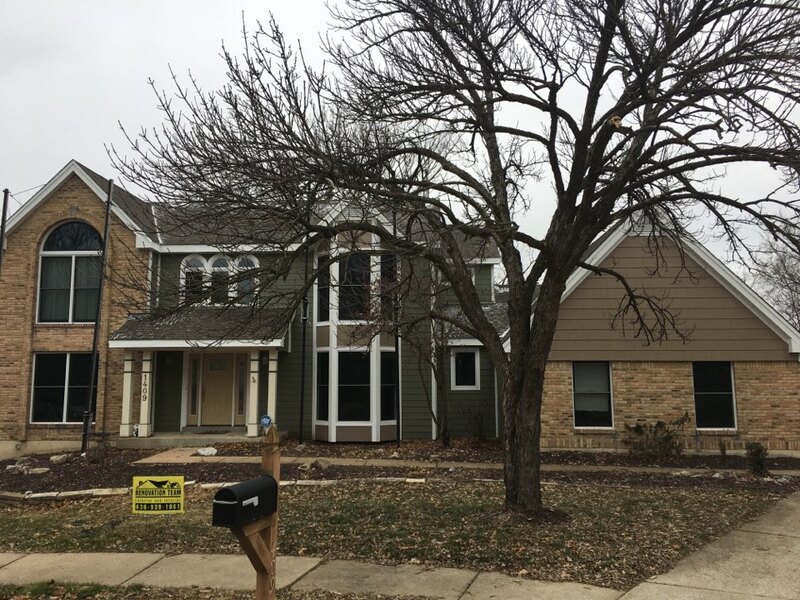 The client chose LP SmartSide hardboard lap siding, color=olive green with white LP trim, LP shake siding in the front gable & Hardie stucco panel around the front bay window. The client also chose Mastic Ventura hidden vent soffit & white aluminum wrap fascia. 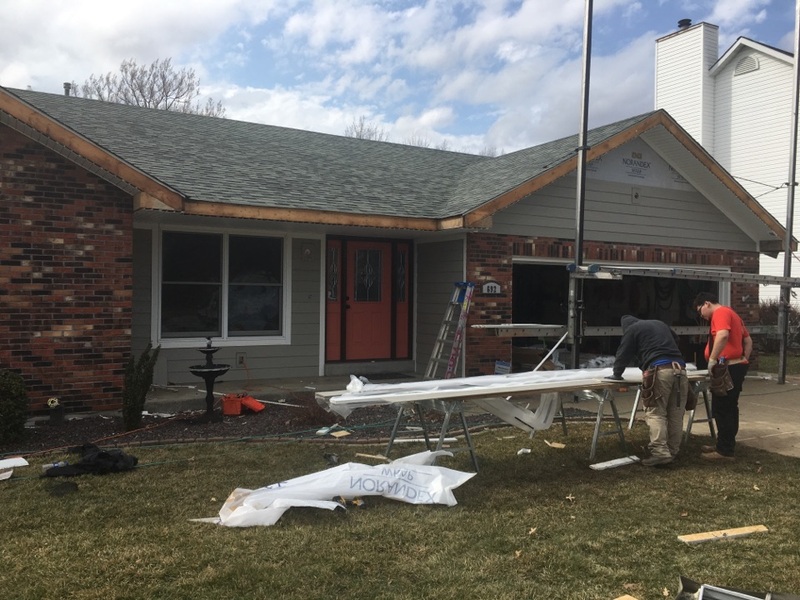 Contact Renovation Team is you want new siding or an exterior makeover!